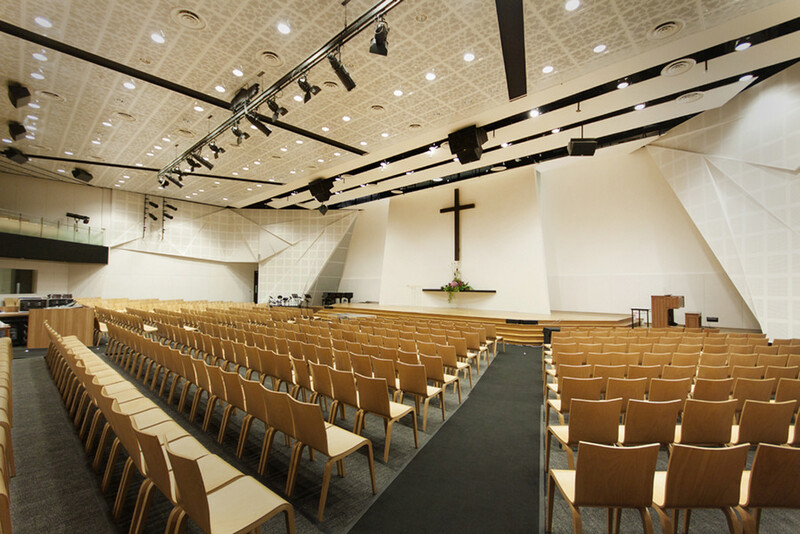 Founded in 1883, Singapore Life Church is one of the oldest Presbyterian Church in Singapore. 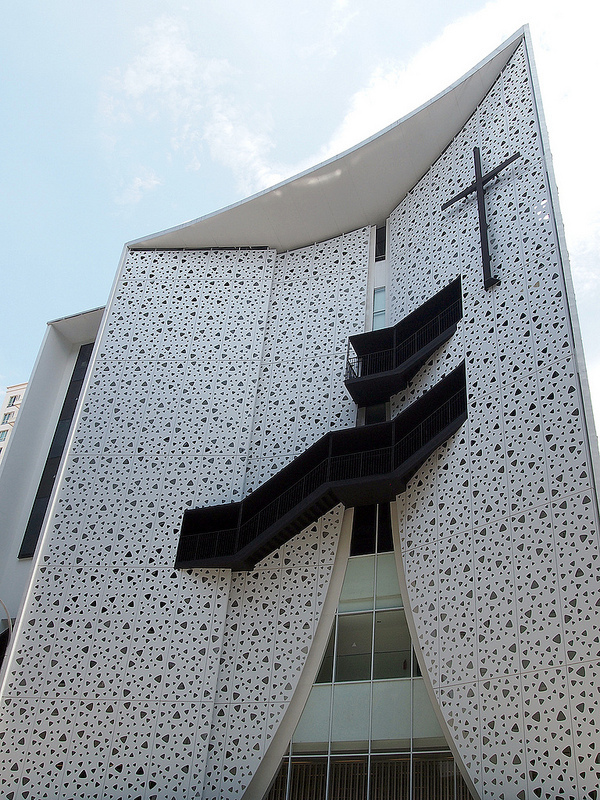 The Church was previously housed on the same site in a 70s-built, modernist structure with an iconic sweeping visage. Due to massive underground construction work nearby, the old building had structural problems resulting in visible cracks on the walls. Moreover, with a large open-air surface car park up front, the land was not fully utilised. 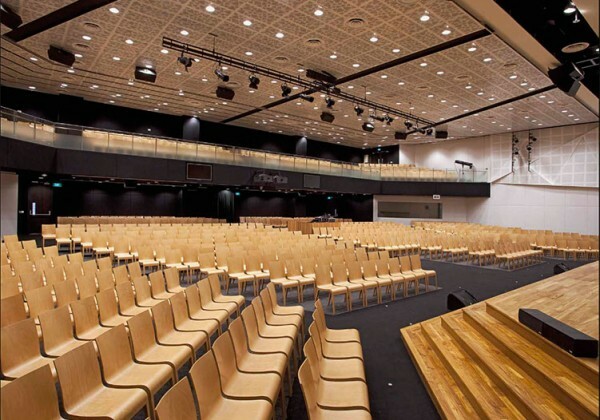 The church’s vision was to have a new building with a larger sanctuary, more space to meet their growing needs and to have an iconic building their members could all be proud of. DESIGN CONCEPT Our design concept is to create a beacon of light within the neighbourhood, symbolizing the hope that Christ brings to this world. 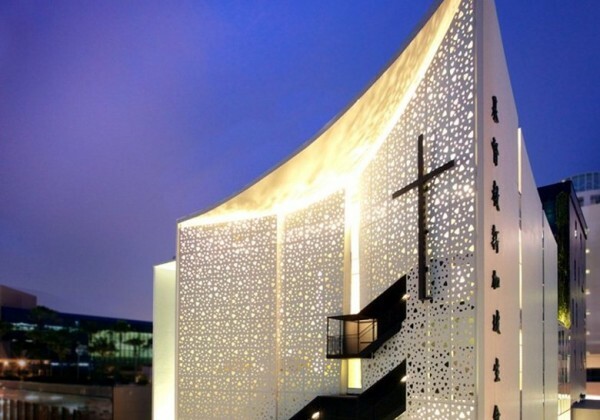 The sweeping roof form, though reminiscent of the predecessor church building, is made contemporary by the seamless white aluminium cladding to create a monolith form. 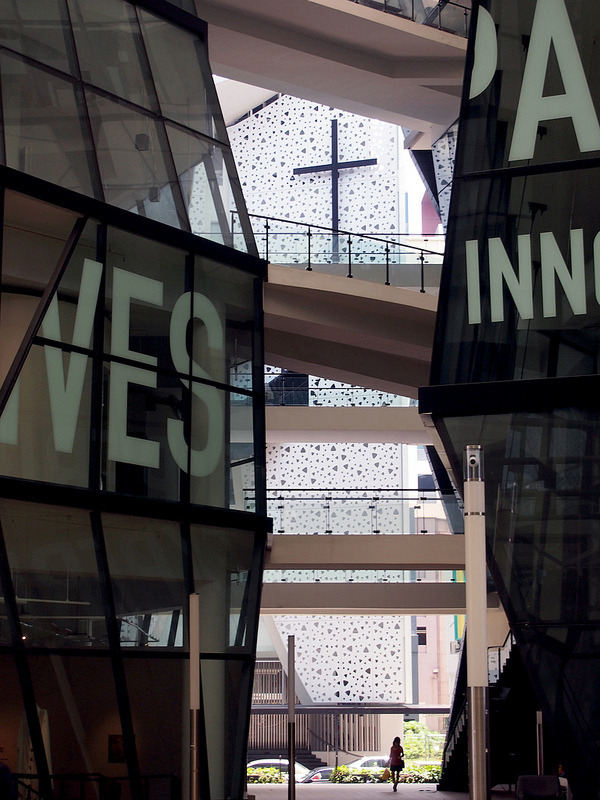 This offers a striking contrast with the monolithic LaSalle College of the Arts building directly opposite. 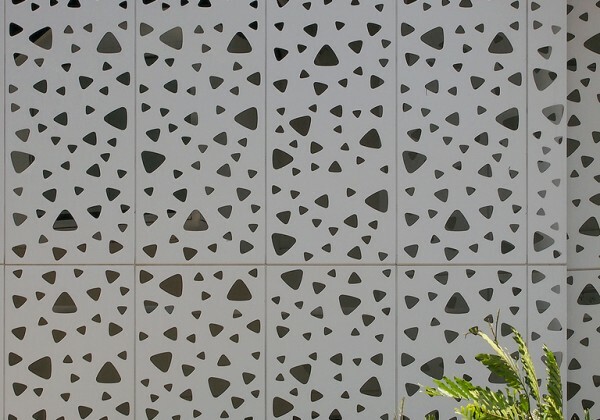 Furthermore, we introduced a sheath of perforated aluminium panels, allowing light to permeate through to create visual identity. 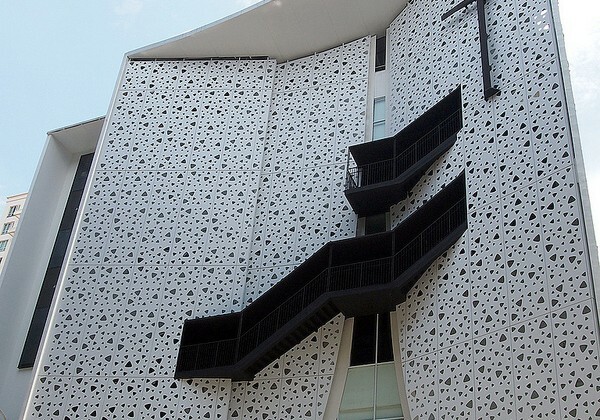 The 3 sections of perforated panels are ‘sewn’ together by two flights of black external staircase which emerge suddenly from behind, stitching itself across and upwards purposefully towards the Cross. The massing of the building is also treated sensitively by positioning the lower block facing Prinsep Street with the taller tower block further behind and divided by an open courtyard. 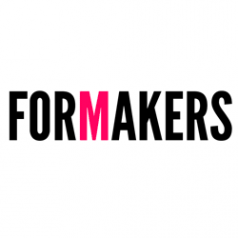 CLIENT’S BRIEF The main intention of the clients in their rebuilding efforts is to maximize the potential of their land, in order to cater for the future growth of the church membership. 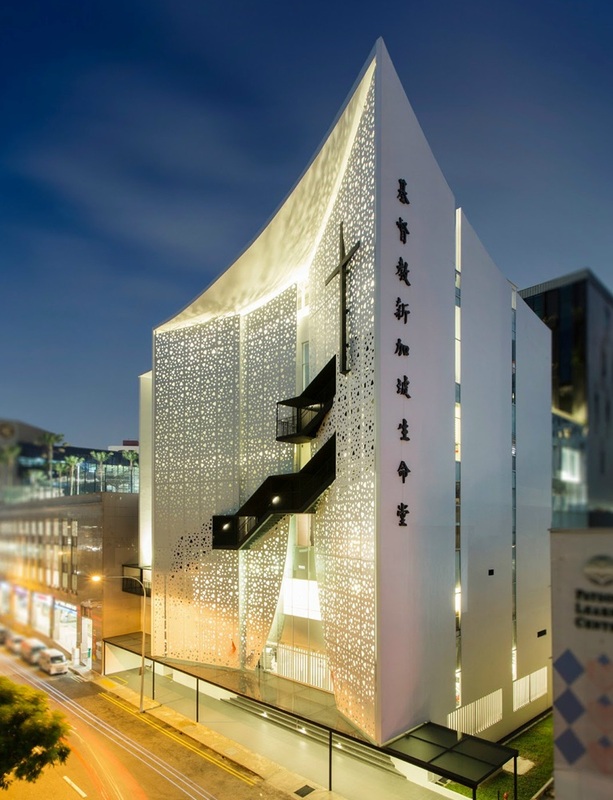 This resulted in a 7-Storey building consisting of a 3-Storey podium block to match the existing urban context with 4-Storey tower block above. 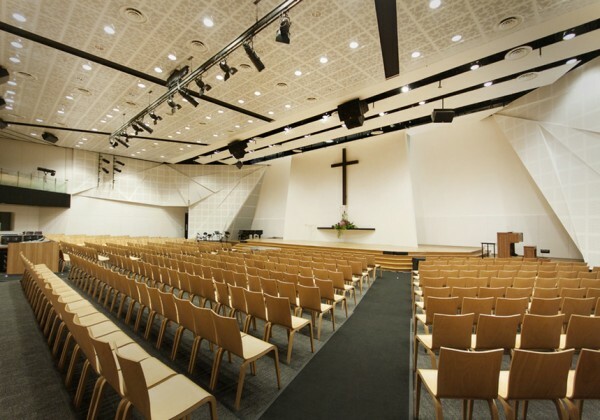 The main requirements in the design brief was for a Main Sanctuary and a smaller chapel to house their worshippers as well as open spaces such as prayer rooms and open spaces for larger communal activities PLANNING CONSTRAINTS The site is an urban infill development that is required to respect the existing urban grain of the surrounding. Thus, in respecting the scale of its neighbours, a progressive stepping form is created to mitigate the iconic sweeping visage form. 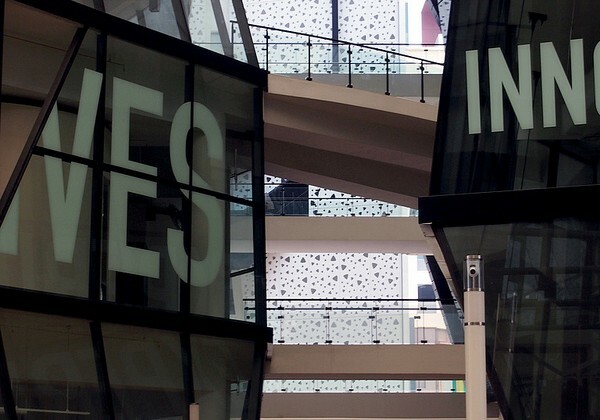 To create a sense of connectivity along Prinsep Street, the main glass opening and the curved main entrance staircase on the 1st storey is positioned to coincide with one of the crevice of LaSalle College of the Arts. 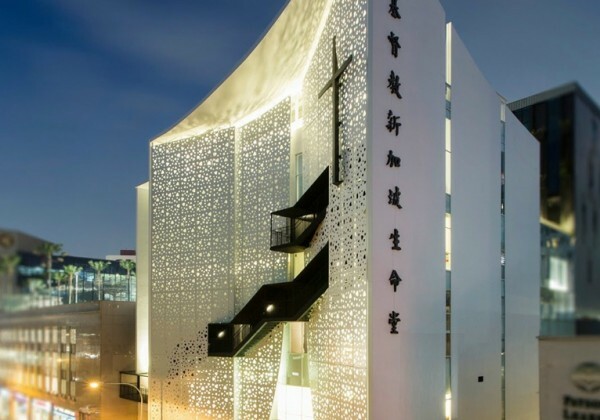 This allows the church building to project a sense of welcome and adds visual interest to the existing streetscape. NIGHT LIGHTING The overall night lighting concept is to create a contrast between the front and the back block of the building. 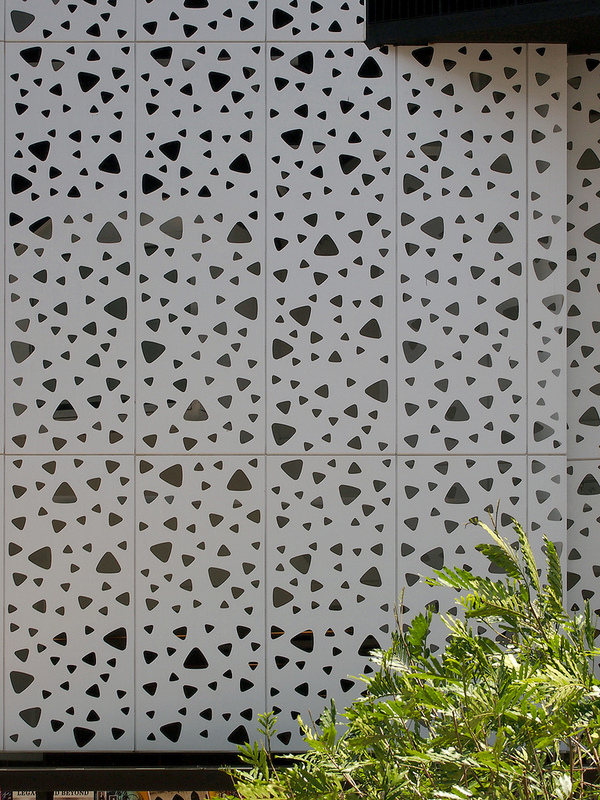 The white front block comprises mainly of the perforated ‘人’ façade patterns indirectly lit by creating a soft glow on the wall surfaces behind. 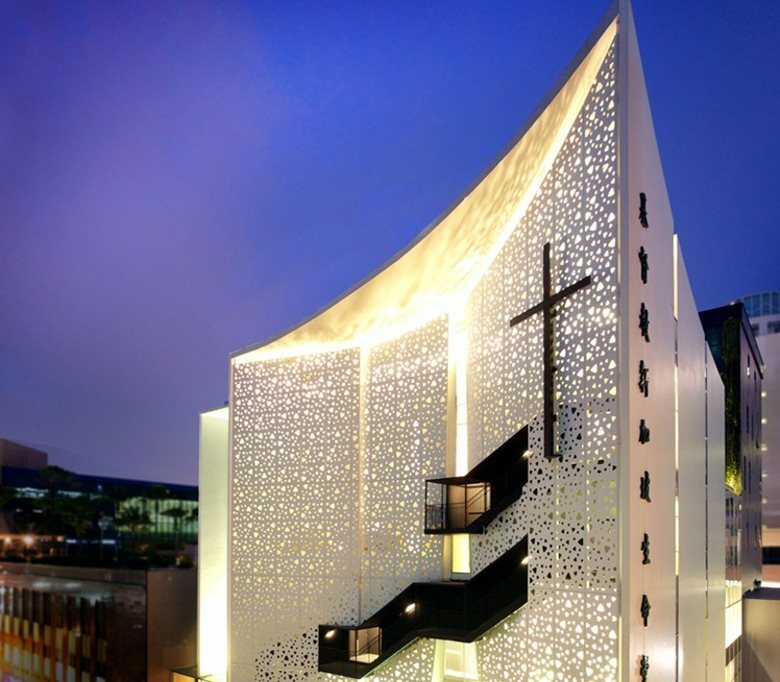 This bright façade creates an elaborately lit backdrop that emphasizes the dark staircase and feature Cross. 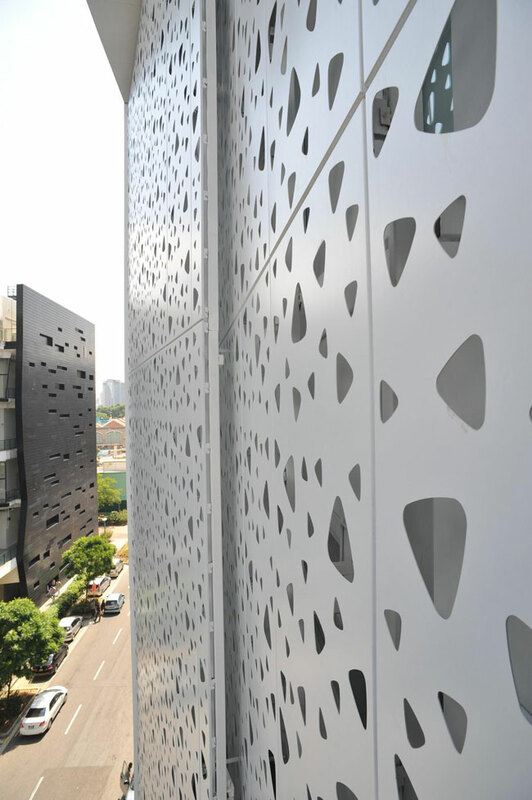 This helps to craft a contrast between the building and the black monolithic LaSalle College of the Arts building opposite.MATERIALS AND METHOD OF CONSTRUCTION The building is primarily constructed with reinforced concrete structures, using post-tensioned beams to create column free spaces. 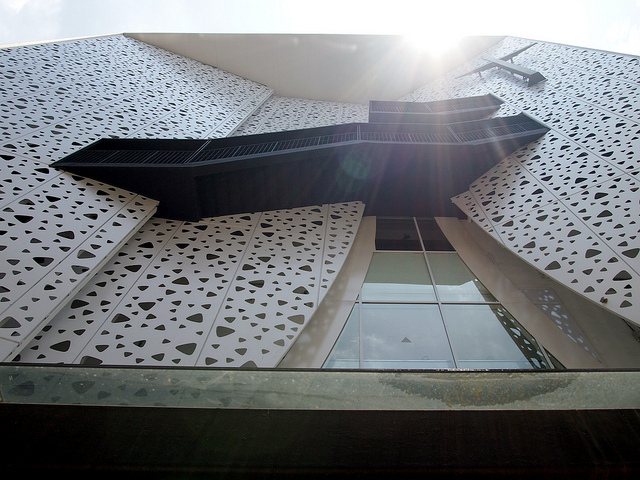 The north-west elevation comprises of a solid facade housed within an elaborate lattic of aluminium perforated panels. 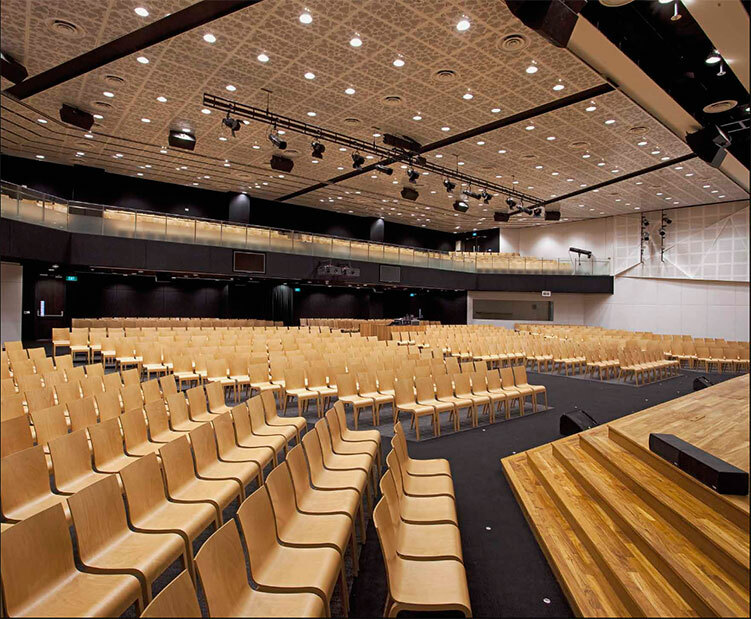 The triangulated perforations on the screen are adapted from the Mandarin character for ‘people’ (人). 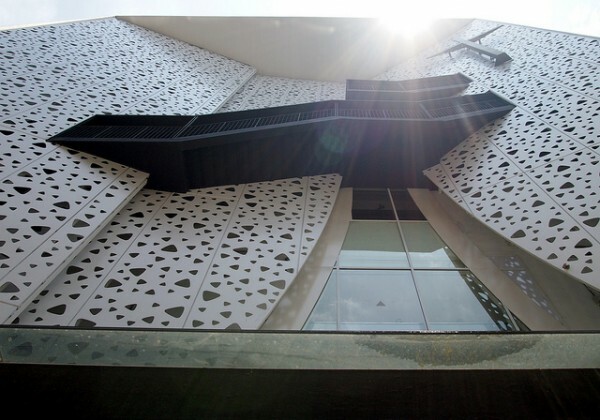 This white aluminium filigree facade together with the sweeping aluminium roof form, serves not only as a second layer of sun shading for the building, but also allows an intricate pattern of light glow when the panels are lit from within. The south-west elevations is finished with plaster and paint with a full height glass curtain wall dividing two portions of the building. 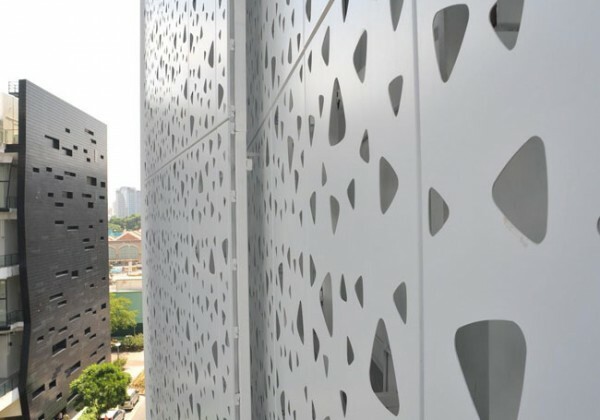 The 1st-storey car park is enclosed with aluminium T-profiled louvres, which screens the car park and offers a different base relief to ‘uplift’ the upper floors.